Contractors who participate in our Home Performance with ENERGY STAR program offer homeowners a comprehensive approach to home improvement that provides better energy efficiency, greater comfort, and lower utility bill. Contractors, such as remodelers, home improvement consultants, insulators and HVAC specialists, can use ENERGY STAR recommended practices to increase their revenues, improve customer satisfaction, and make homes perform better. These specially-trained contractors evaluate homes using state-of-the-art equipment and recommend comprehensive improvements that will yield the best results. 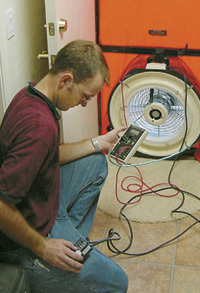 Contractors using the whole house approach of Home Performance with ENERGY STAR deliver a unique message and unique approach that is convincing when accompanied by diagnostic testing. This approach tends to build the customer’s trust and confidence in you. The benefits to the contractor are apparent, with increased closing rates and potentially more extensive jobs. The benefit for the customer is a house that performs better, costs less money to operate, and is a more comfortable, healthier place to live.